Let Miles Supply help you choose which dust collector is best for you. The DFE dust collector is a continuous-duty, modular collector with cartridge-style filters. The downward air flow design delivers high filtration efficiency while using less energy. Continuous duty means the filters can be pulse cleaned on-line without interrupting air flow through the collector. The filters are pulse-cleaned in sequence, one set at a time, without turning the collector off. Each standard collector is two or three filter columns wide by two or three filter rows high by one filter deep. 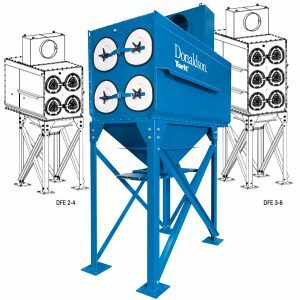 Designed to increase the versatility of the collector, standard options include abrasion-resistant inlets, extended dirty-air plenums, air management modules, and clean change options.